I was beginning to think it wasn't going to happen. Everyday I would walk outside to see if that first tiny bud on any plant whatsoever in my garden was going to be the first brave soul to burst forth and share it's beauty. Our weather in the Midwest has been up and down and in and out. It's the strangest spring I can remember in a long time. 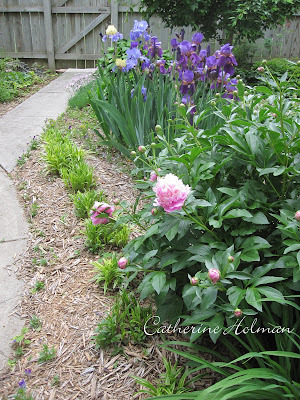 I see all over the blogging world that peonies have come alive in gorgeous hues with layers upon layers of petals and mine are just now beginning to bloom. I was surprised to see the first of my roses on this thornless Zephirine Drouhin climber as it winds it's way through my gazebo. 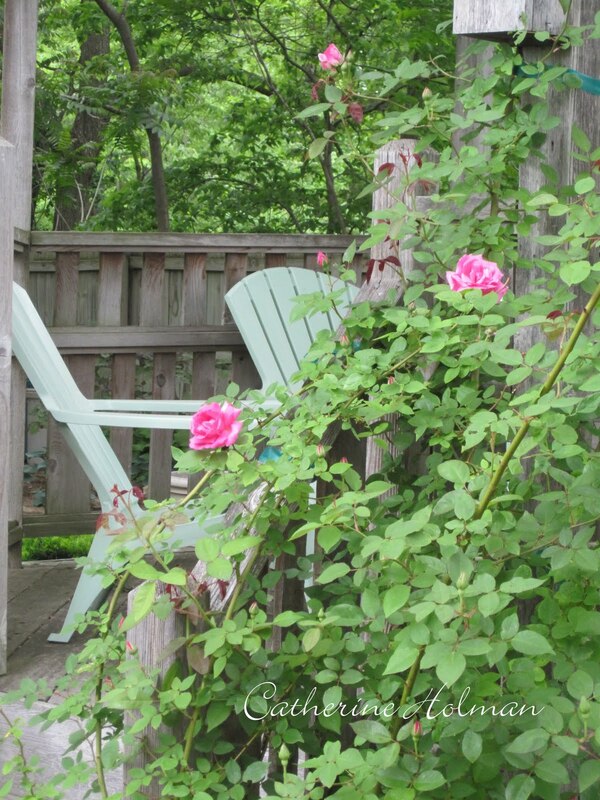 Soon their sweet aroma will fill the air and "hopefully" I'll be able to sit here surrounded by their pink loveliness. 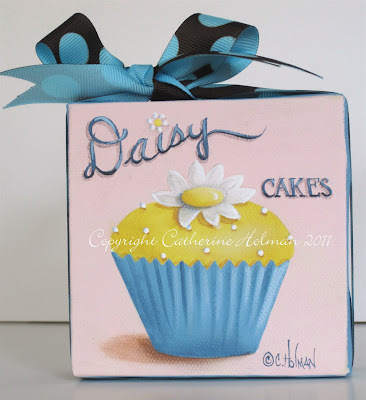 In honor of my bloomin' garden, I was inspired to paint "Daisy Cakes", my newest addition to my eBay auctions. Fresh as a summer breeze, this little yellow cupcake is topped with a pretty daisy and tiny white candies. 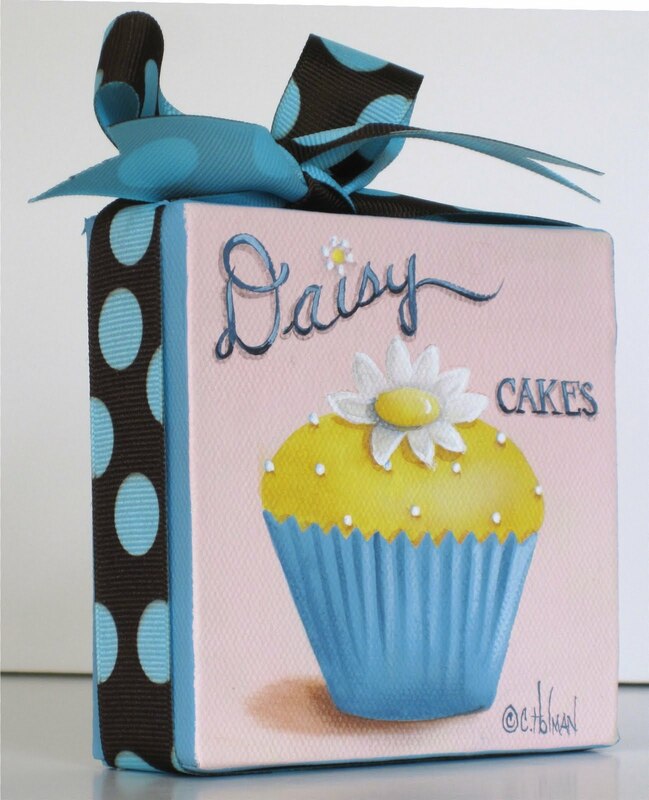 A blue and brown polka dot ribbon is wrapped around the edges of the canvas and ties in a bow at the top. Rain is in the forecast for the next 6 days and I'm afraid if I don't get outside soon and out of the kitchen, my hips will be bloomin' instead of my garden! Here's to calorie free pieces of dessert yumminess! If you're interested in this diet check out my paintings and prints in my Etsy and eBay stores. Your flowers are gorgeous and your cupcake is so cute!! Your garden is blushing right now and it will be in full bloom soon! Love the Irises Cathering, mine are just starting to bloom now too. I so look forward to them each year. Love your sweet daisy cupcake...it reminds me of summer. Love you adorable cupcake. I'm so excited too, I finally have tulips in my front yard. My neighbor passed away, and there is not weed wacking, so I have tulips. And my backyard is filled with wonderful forget me nots. My Iris' are up and green but no blooms yet. We've just these last two days shedded our winter coats. I suspect the cold is the reason my tulips are so tall. 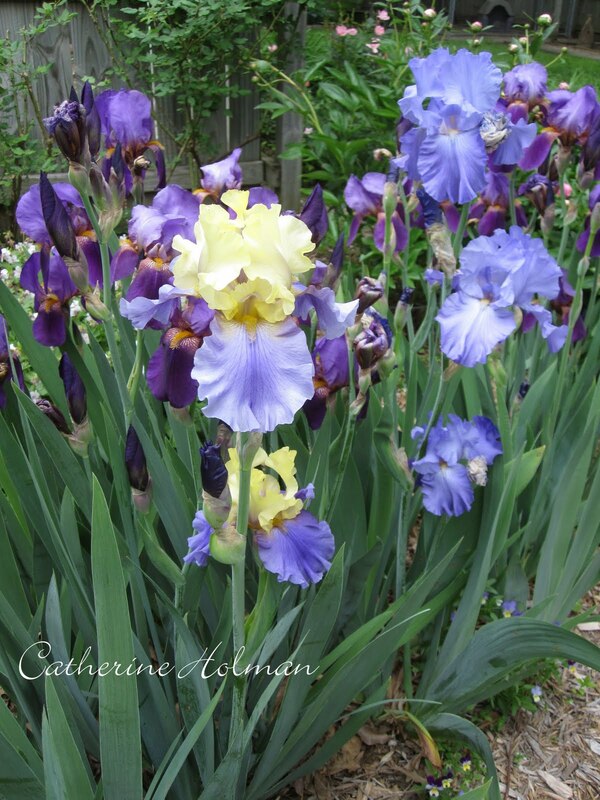 Your flowers are beautiful, Cathie. 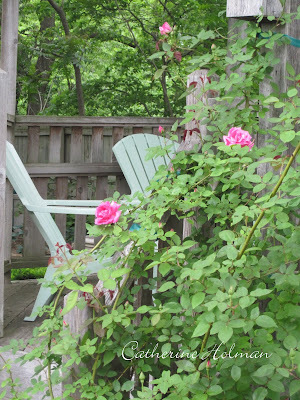 My irises and peonies are over now, but I'm enjoying the roses. Your daisy cupcake is adorable! Love it. Enjoy the rain, that's my favorite time to paint or snuggle up with a book. 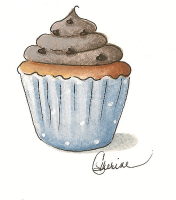 Love that Bea Sweet cupcake. That's what I'm always telling my girls.